Spend a day in the park, have some fun, and learn about the importance of prescribed fire, fire safety, and preserving the Real Florida! Fire Fest is a Halloween-themed event welcoming the community and visitors to learn about prescribed fire and Florida’s unique wildlife, plants, recreation, and rich natural history. 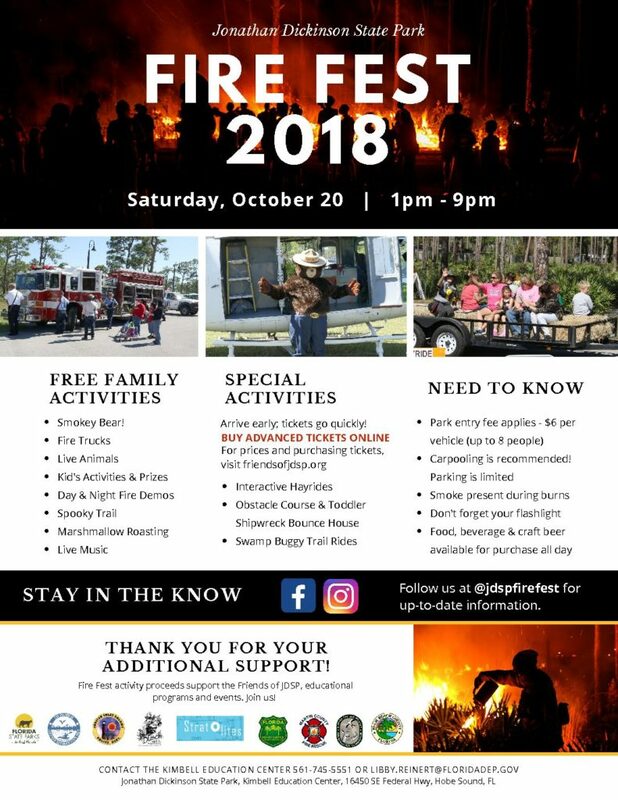 Free family activities include burn demonstrations, live music, craft beer, exhibitors and arts and crafts, fire trucks and helicopters, live animal demonstrations, scavenger hunts, marshmallow roasting, spooky trail, and more! Special activities for additional fees include interactive hayrides, bounce house and game area, and swamp buggy trail rides. Activity times vary throughout the day. Visit friendsofjdsp.org or contact the Kimbell Education Center in the park, 561-745-5551, libby.reinert@dep.state.fl.us. Fire Fest is sponsored by the Friends of Jonathan Dickinson State Park, Inc.